Who needs California, when you have a nice Arkansas River standing wave to surf on! Lots of people congregating down on the water for a fun surf contest that will be held tomorrow. Many of the out-of-towners are camping along the river tonight and starting the festivities off before the event tomorrow. 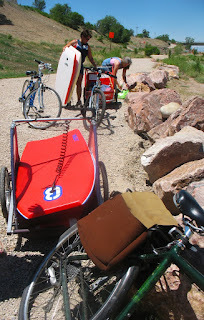 Lots of families with bicycle trailers full of surf gear too!